The particular evidence of concern in this report are claims made by Bellingcat about three sites that were attacked by air on April 4, 2017 in Khan Sheikhoun with general-purpose bombs. The alleged locations of the locations of the sarin release site and the three sites that Bellingcat concludes were attacked with general purpose bombs are shown in Figure 1 below from the New York Times video. The method used by Bellingcat to find the areas of bomb damage depend on line-of-sight data established from a panoramic view of Khan Sheikhoun on the day of the attack – April 4, 2017 (see Figure 2). This composite panoramic view was derived from a video-scan of the horizon taken north of Khan Sheikhoun looking south. As can be seen from the composite panoramic shown below in Figure 2, there are three bomb-debris clouds rising from the three areas that Bellingcat asserts were bombed on April 4. The detailed analysis that will be presented later in this paper will show that this panoramic scene could not have been recorded on April 4, 2017 as claimed by Bellingcat. Location of bomb-debris clouds at three sites in Khan Sheikhoun that Bellingcat alleges were attacked with general-purpose bombs on April 4 2017. The detailed analysis of Bellingcat’s own forensic evidence shows that this panoramic scene could not have been recorded on April 4, 2017. Later in this report I will show using basic information about the fundamental characteristics of bombs that debris clouds 2 and 3 are the result of the detonations of single 500 to 1000 pound general-purpose bombs. Debris cloud 1, which has a considerably larger base diameter than clouds 1 and 2, indicates that it was created by an attack using 2 or 3 bombs in the 500 to 1000 pound weight-class or it was possibly created by secondary explosions in an ammunition dump that was hit with single or multiple bombs. That is, the damage area associated with bomb-cloud 1 is predictably considerably larger than the bomb- damage areas associated with debris clouds 2 and 3. The Bellingcat analysts used this panoramic view from the wrong day to establish lines of sight to each of the bombed areas. They then used before and after satellite images to search along the lines of sight for areas of bomb damage. In spite of all the evidence that Bellingcat had that indicated the panoramic was from the wrong day, they still found three locations where they allege bomb damage occurred. This report shows that NONE of the bomb-damage areas identified by Bellingcat and shown in the New York Times video show any indication of bomb damage from 500 to 1000 pound bombs. That is, the data from the panoramic view is clearly and unambiguously inconsistent with the claims of bomb damage from the satellite photographs. In fact NONE of the forensic data claimed by Bellingcat in the New York Times as evidence of general-purpose bomb damage on April 4 supports the conclusions that are said to have been derived from the forensic data. In all, when these false claims about information provided in the forensic data are brought together with the claims about a sarin release site, the conclusion is inescapable that all of the evidence referred to by Bellingcat in the New York Times shows no evidence to support their narrative. This means that the narratives put forward by the New York Times, and the closely related Human Rights Watch report of May 1, are all based on forensic evidence and conclusions that are unambiguously false. If the wind was blowing in the opposite direction as shown in the panoramic view alleged to have been recorded on April 4, the sarin from the alleged sarin-release site would have drifted into open fields and would not have reached any populated areas for more than half a kilometer. Hence, there would be no casualties from a sarin release at this site as alleged by the New York Times, Human Rights Watch, and Bellingcat. Given the small size of alleged sarin releasing container (containing no more than 5 to 10 liters), and the large distance between the nearest populated area and the sarin-release site, even with near ideal weather conditions for a deadly sarin dispersal, there would have been essentially NO casualties from the sarin-release in any densely populated areas downwind. The three areas where Bellingcat claims bomb damage occurred show NO evidence of bomb damage consistent with the observed bomb-debris clouds that indicate the delivery of 500 to 1000 pound bombs. Video of an alleged bombing of a target in March 2015 in Khan Sheikhoun shows a large area of heavy bomb damage that is completely inconsistent with the minuscule or nonexistent bomb damage in the three bombed sites allegedly found by Bellingcat from the alleged events on April 4, 2017. The bomb-damage video from March 2015 shows a bomb-debris cloud that is much like the large bomb-debris cloud 1 allegedly produced on April 4, 2017. While the area bombed in March 2015 shows extensive and unambiguous severe bomb damage, the area where Bellingcat alleges bomb damage at site 1 on April 4 shows only minuscule or no bomb damage. This raises very serious questions about the veracity of Bellingcat’s claims about the forensic evidence of bomb-site damage. In summary, video sequences of the alleged bombing in March 2015 show that three bombs in the 500 to 1000 pound class were dropped on the target. Before and after satellite images also shown in the New York Times video of the alleged site that was bombed in March 2015 show an area of roughly 400 feet diameter that was completely demolished by the alleged bombing attack. Damage site 1 identified by Bellingcat as being associated with a similar very large bomb-debris cloud created on April 4, 2017 shows only minuscule or no damage relative to the vast area that was demolished in March 2015. Although the New York Times video shows a bomb debris cloud in March 2015 and a completely demolished site associated with that bombing, it appears that nobody performing the analysis of the forensic data asked an obvious question; why was a bomb debris cloud associated with a large area of heavy ground-damage in one case but either no damage or minuscule damage from the bombing could be found in the other three cases where bomb-damage debris clouds were observed? How Bellingcat reached any of its conclusions in the face of coherent and internally consistent forensic evidence to the contrary is inexplicable – the complete lack of any forensic evidence of bomb damage generated by the use of the panoramic view allegedly recorded on April 4, 2017; the inconsistencies in the the wind direction observed in the panoramic view with weather reports for April 4; and an analytic process that failed to observe bomb damage consistent with the observed bomb-debris clouds or wind directions that could credibly carry a deadly sarin release plume into range of any densely populated area. The remainder of this report will focus on the specific forensic evidence presented in the New York Times video. The discussion will show, with example by example of forensic evidence from the New York Times video, that the interpretation of every piece of forensic evidence in the video is spurious, leading to the absolute and unambiguous conclusion that none of the findings asserted in the video are supported by the facts. The report will first describe the basic design features of general-purpose bombs. It will then explain how the bombs inflict damage, the spatial scale and destructive effects caused by the detonation of such bombs, and the characteristics of the easily observable bomb-debris clouds that are generated by the bomb detonations. In next section will show how the panoramic was allegedly used to find the three bomb-damage sites. We will show that the alleged locations of the observed bomb damage sites in the panoramic view were at ranges of roughly 1 to 2.5 miles from the camera. We will also show that one of the alleged bombing-sites is not aligned with the line-of-sight in the panoramic view. This raises further questions about the veracity of the analysis produced by Bellingcat. After this we will show the video evidence of before and after satellite imagery of the three bombed areas that were allegedly identified by Bellingcat with the line-of-sight data from the panoramic view. It will be shown that there is absolutely no evidence of bomb damage consistent with the observed bomb- debris clouds shown in the panoramic view. In the section that then follows, video frames of the alleged bombing in March 2015 extracted from the New York Times video will show that the debris cloud generated from the March 2015 attack indicate 3 bombs were used in that attack. The satellite imagery provided in the New York Times video of the severely damaged area from that attack will be shown. The point of showing these video frames from the New York Times video is to show that both the Bellingcat and New York Times analysts who put together the video had to know that there was extensive bomb-damage on the ground associated with the large debris cloud from the March 2015 attack. As such, they should have known and expected to find a large area of demolished buildings extending over at least a city block at site 1, where either multiple bombs were dropped or there were extensive secondary explosions on the ground. The advantage of using YouTube is that readers with sufficient interest can download the video directly onto a computer and easily study it frame by frame. Above Composite from Top of Page 24 of the Human Rights Watch Report Death by Chemicals, first published on May 5, 2017. The diagrams below provide basic information about the design of “general-purpose bombs” and the physical effects associated with their use. A basic general-purpose bomb is roughly 50% by weight explosives and 50% by weight metal casing (see Figure 3). This design choice is used to increase the lethality and destructiveness of the bomb. When the explosives in the bomb detonate, the heavy metal casing is shattered into numerous fragments by the hot expanding high-pressure explosive gas products, accelerating them to quite high speeds, of order 2 km/s. These high-speed fragments can do tremendous damage to a target even before the shockwave generated by the expanding explosive gases arrives at elements of the target (the fragments travel faster than the shockwave except at very short distances from the bomb casing). The above diagram shows a Russian general-purpose bomb, which in terms of concept is the same as those used in the West. Half of the weight of general-purpose bombs is explosives and the other half is metal casing. When the explosives detonate they shatter the metal casing into thousands of fragments that weigh several grams each and travel at nearly 2 km/s (about 4500 mph). These high speed fragments can create tremendous damage to the target before the shockwave arrives. They also create a spray of lethal fragments that greatly increase the killing range against exposed personnel. Figure 4 below shows the vast number of fragments that are typically produced by general-purpose bombs with casings of various wall thicknesses. Fragments generated by the explosion of the munition that is roughly 50% weight by explosives and 50% weight by metal casing. These fragments travel at a speed near 2 km/s (about 4500 mph). Figure 5 on the next page shows the early phases of the detonation process. The detonation of the explosives in the bomb produce violently expanding high-temperature gases which act like a fast moving piston on the metal casing and the surrounding ambient air. In the process of expanding, the casing shatters, pieces are accelerated to high speeds, and a shell of compressed ambient air forms a shockwave of compressed air that propagates outward on its own at slightly above the speed of sound (0.34 km/sec or about 760 mph) causing damage to structural elements that it encounters. The hot expanding gases from explosive mixing with entrained ambient air create a “bubble” of hot gases that is left behind at the detonation point as the shock propagates into the surrounding environment. This bubble of hot gases then buoyantly rises from the detonation point, carrying entrained dust, pieces of target debris, and bomb remnants along with it as it rises. When a general-purpose bomb explodes it creates a volume of hot air from the mixing of the extremely hot gases produced in the explosion with nearby surrounding air that is incorporated into the turbulent expanding explosive gases. Fragments from the casing can cause serious damage to surrounding structural elements before the blast wave arrives and can kill people at many hundreds of meters range. For bombs in the weight-range of 500 to 1000 pounds, the resulting “bubble” of hot buoyantly rising air initially left behind at the point of detonation carries target debris and other materials with it to an eventual full altitude of between 1000 and 1500 feet. The cloud has an overall shape like a mushroom where the crown is the remnant of the initial bubble of hot air from the initial explosion. As shown on the next page in Figure 6, the initial explosion creates a dust cloud that is made up of the original hot expanding gases along with a “pedestal” of dust that is kicked up by the shockwave as it expands beyond the area of initially hot expanding gases. As the dust cloud evolves in time, it develops into a mushroom shaped debris-cloud where the original hot bomb gases form the crown of the cloud and the suction created by the rising crown of hot gases creates a “stem” which contains dust from the pulverized target. Two examples of bomb-debris clouds from general-purpose bombs in the weight-range of 500 to 1000 pounds. The early debris cloud on the left is from two or three bombs hitting around the same location. The later-time debris cloud on the right is probably generated by a single general-purpose bomb in the 1000 pound weight-class. There are various methods that have been developed to estimate the size of the crown of the debris cloud and its height. These estimation techniques are fundamentally approximate, as the cloud can be shaped by the temperature profile of the air, wind shear, and ambient winds. However, when a large bomb hits a target the result is a debris cloud that is unambiguously connected to the size of the munition that has been used. This fundamental fact of physics reveals that the New York Times video about the attack on Khan Sheikhoun makes claims that are completely incompatible with the forensic evidence they show. This illustration shows an example of a numerical estimation procedure for making rough estimates of the weight of general- purpose bombs from bomb debris cloud dimensions observed in combat. The equations are derived from fitting data to numerous observations of bomb explosions. Figures 3 through 6 are from materials left to me by my dear friend and colleague, Richard Lloyd, who died from cancer on October 31, 2014. One of his last requests to me was that the accumulated treasures of his research be made available for public policy analysis. Figure 8 below shows rough estimates of the blast overpressure versus range for general-purpose bombs of different weights. These curves include the fact that roughly half of the weight of the general-purpose bombs is explosives and the remaining weight is casing. A widely-known and documentable fact is that a blast overpressure of 30 psi from such a bomb will result in the complete demolition of an urban structural target. As shown in the Figure 8 graph, a 1000 pound general-purpose bomb will cause this result at a range of about 50 feet. As a result, the detonation of a 1000 pound general-purpose bomb will completely demolish urban structures that have not been built to military specifications over a circular area of roughly more than 100 feet in diameter. An important additional consideration is that the level of damage done to a target from bomb blasts is highly dependent on the nature of the structure. In the case of the bombing attacks on buildings of the type that populate Khan Sheikhoun, variations in the strengths of building walls can make a very large difference in the size of an area that is essentially “flattened” by a bomb-hit. Although a blast overpressure of 30 psi will almost certainly knock the walls out and cause the complete collapse of a building, a blast overpressure of 20 psi could well produce the same result. This means that the diameter of an area completely demolished by a 1000 pound bomb could be between 100 and 150 feet. In the diagrams we subsequently show we will designate the areas that could be completely demolished in terms of concentric circles with diameters of 100 and 150 feet consecutively. The above graph shows the blast overpressure versus range for general-purpose bombs of various weights. As can be seen by inspecting the graph, a blast overpressure of about 30 psi will occur at 50 feet from the detonation point of 1000 pound bomb. Figure 9 on the next page shows the panoramic constructed by Bellingcat which forms the foundation and basic source of analysis used by the New York Times and Human Rights Watch in their published forensics-based analyses of the Syrian air attack on Khan Sheikhoun on April 4, 2017. The analyses assert that this panoramic shows that three separate targets were hit with general-purpose explosive bombs on April 4, 2017 in addition to a fourth sarin-dispersing airdropped munition with an explosive charge that was too small to create the large and visible bomb-damage debris clouds that could be observed at long-range shown in this panoramic. The New York Times video claims that this panoramic allowed them to locate where the 500 to 1000 pound explosive bombs were dropped. The described analysis process on the surface appears straightforward, but a more expert review of the forensic evidence shows that the analysis and its results are profoundly in error. The analysts first determined the line-of-sight to each of the debris clouds relative to the known locations of thee minarets and the flat mound that is in the middle and foreground of the panoramic view. As a result of its very distinct appearance, the flat mound and its well defined edges, is a feature that can be be used to get a relatively precise estimate of the bore-site of the camera that produced the panoramic. Such a mound is known among archaeologists as a, tell, which is formed from the accumulated remains of a series of walled towns built successively on top of each other. In the case of Khan Sheikhoun, this mound dates back about 4000 years to the bronze and iron ages. This particular mound is about 200 to 250 m long and 18 to 25 m high. A very important immediate issue is raised when the motion of the bomb-debris clouds in the panoramic view is examined. The general direction of the debris-clouds is to the east. As shown in Figures 10 and 11, this instantly raises the question about how the alleged sarin release site could have created so many casualties so quickly. In Figure 10, the wind conditions obtained from weather reports suggests that a sarin release at that site would have carried sarin directly into a nearby heavily populated area immediately to the east northeast of the alleged release site. If enough sarin had been released, and if it also was released in a way that effectively caused it to quickly evaporate, then the wind as reported by weather stations in the area would have carried a relatively dense cloud of sarin vapor and droplets into the adjacent population area causing heavy casualties near the sarin-release site. However, if as shown in Figure 11, the wind was gently blowing to the east, the sarin would have instead created a plume that would have had to travel in excess of 600 to 700 m before encountering a densely populated area. Even relatively large amounts of sarin released on the ground near the alleged sarin release site would be unlikely to create a killing area at this range unless an airdropped munition of perhaps 1000 or 2000 pounds very efficiently dispensed the sarin at altitude above the ground. It is therefore clear that the assumption that the panoramic view was taken on April 4, 2017 directly contradicts the claim that a large group of people were poisoned by a sarin release from this particular site as alleged by the New York Times and Bellingcat analysts. The above panoramic derived from a video taken north of Khan Sheikhoun looking South shows the three bomb debris-clouds. The debris cloud labeled 1 is almost certainly from either multiple 500 to 1000 pound bombs, or possibly from single or multiple bombs that hit an ammunition dump causing secondary explosions. Clouds 2 and 3 appear to be from single bombs hitting targets. As will be shown in a later section of this paper, if the target locations claimed by the New York Times and Bellingcat analysts were correct, clouds 1 and 2 would be about 1 mile from the camera and cloud 3 would be about 2.5 miles from the camera. This satellite image shows the alleged location of the sarin release site and the predicted direction of the sarin plume as indicated by weather reports on April 4, 2017. This satellite image shows the direction the sarin plume would be carried from the alleged sarin release site if the panoramic view used in the New York Times analysis was in fact taken on April 4, 2017. Gigantic amounts of sarin would be needed to kill and injure people at the roughly 600 m range where there is a center of population. In summary, the inconsistencies in the forensic evidence from the panoramic view should have raised fundamental questions about the assumption that the panoramic view was recorded on April 4, 2017. It then should have raised questions about the use of this panoramic view has a foundation for the New York Times, Human Rights Watch, and Bellingcat analyses. If the sarin release site was at the location alleged by all three organizations, the only way significant casualties could be generated would be if the wind was blowing to the west northwest as predicted by the weather reports on April 4, 2017. If the wind is instead blowing to the east, as shown in the panoramic, the sarin release cloud would move across empty open fields for a distance of 600 to 700 m before encountering a dense center of population. In order to achieve lethality at such a long range, the nerve-agent plume from a release at ground-level would need to have efficiently dispersed many tens of liters of sarin in extremely stable weather conditions that would keep the sarin plume low to the ground as it moved towards the population center. As shown in reference one critiquing the Human Rights Report of May 1, 2017, there is absolutely no evidence of any kind of a munition at the alleged sarin release site that could be nearly large enough to carry the amounts of sarin needed to cause casualties at these large ranges. It therefore seems that the panoramic view contradicts the conclusion that the sarin release site was the source of a nerve agent attack and that the panoramic was recorded on April 4, 2017. As already noted, the New York Times video claims that the panoramic view provided the analysts with line-of-sight data from the video camera to the three locations where 500 to 1000 pound explosive bombs were dropped. We will now examine the before and after satellite images used by the New York Times analysts to conclude they had found the three bomb-damage sites associated with the three bomb-damage debris clouds seen in the panoramic video. Figures 12 and 13 show a satellite photograph of Khan Sheikhoun as displayed in the New York Times video. Figure 12 shows satellite photograph exactly as it is presented in the New York Times video and Figure 13 shows the same image but with locations labeled so as to provide the reader with orientation. This satellite image published in the New York Times video analysis shows the alleged locations of the sarin release site and the three bomb-damage sites identified with the panoramic view of Khan Sheikhoun. The alleged location of the camera north of Khan Sheikhoun looking South has been provided by Bellingcat, so it is possible to use the bomb-damage locations found by Bellingcat and the location of the camera to verify Bellingcat’s findings. Figure 14 below shows the manipulations of the panoramic view so it can be used together with the satellite images of Khan Sheikhoun to determine the line-of-sight to the damage areas. Figure 15 on the next page shows Bellingcat’s determination of the location of the bomb damage locations and the vector directions to the damage sites on the satellite image. The above set of images show how the alleged locations of bomb-damage sites can be used to verify their consistency with the panoramic view. This is done by scaling the size of the panoramic view so that debris-cloud 1, debris cloud 3, and the archaeological flat mound are all in alignment as shown in Figure 15 on the next page. The scaled panoramic view is also rotated so that its length is perpendicular to the line-of-sight of the camera that recorded the panoramic view. This is then overlaid on a satellite image that includes the area where the camera was operating. The result of this process is shown in Figure 15. What is immediately evident from an inspection of Figure 15 is that although the edges of the flat archaeological mound and the centers of the debris-clouds 1 and 3 align with the line-of-sight of the camera, debris-cloud 2 is not aligned. Since the precision of the imagery is quite high, there is no doubt that the location of the bomb-damage site 2 identified by the New York Times analysts is inconsistent with the panoramic view that was assumed by Bellingcat and the New York Times to be recorded on April 4, 2017. The next step in the process of determining the veracity of the alleged the alleged forensic evidence associated with events on April 4, 2017 as claimed by Bellingcat and the New York Times is to look at the before and after photographs of the damage sites. As can be seen from inspecting the alignments of the locations and the camera line-of-sight, the flat mound and debris-cloud locations 1 and 3 are aligned. However, debris-cloud 2 is badly out of alignment with the other objects. This lack of registration between the alleged bombing locations and the camera line-of-sight is another very strong indication that the analysis of the panoramic view is not consistent with the asserted claims about bombing locations and levels of damage on April 4, 2017. The first issue that should have raised questions for the Bellingcat and New York Times analysts is the time between the before and after satellite photographs. The “before” satellite images were taken on February 21, 2017 and the “after” images were taken on April 6, 2017. This is a time interval of 44 days. As a result, if Khan Sheikhoun was under air attack anytime within a 44 day time-period, damage from these earlier attacks could potentially be mistaken for damage inflicted on April 4, 2017. However, as a review of the data will show, this issue is not of concern – the reason being that there is no evidence ofbomb damage of any kind at any of the three sites identified by the New York Times. Figure 16 shows debris-cloud 3 as seen from the camera that recorded the panoramic view. As already noted, the analytical method used by the New York Times to find the bombed site is critically dependent on the use of line-of-sight data from the panoramic view. The analysts claim to have located the bomb- damage by searching satellite imagery along the vector direction determined by each bomb-debris cloud. Bomb cloud 3 indicates the detonation of a 500 to 1000 pound general-purpose bomb. If the site located by Bellingcat and the New York Times was correctly located, the debris cloud in this image would be at a range of about 2.5 miles. At the time the image was taken the cloud-top was at an altitude of about 500 to 600 feet. Given the size of the explosion, the expected levels of damage from a bomb of this size would be extensive if it had landed in an area populated by buildings. Figure 17 below below shows the before and after satellite photographs that Bellingcat and the New York Times analysts allege show evidence of bomb damage associated with bomb-debris cloud 3. The author has tested roughly a dozen people without special knowledge of bomb effects to determine how evident damage is from this composite dual image photo. None of these people were able to find the bomb damage from the unmarked before and after images in this graphic. The above before and after photographs are supposed to show the bomb damage done in the area associated with debris-cloud 3 identified in the panoramic shown in figure 16. The author has shown this New York Times photograph to perhaps a dozen nonspecialists and asked them to find the bomb-damage area. None of them succeeded. The bomb damage locations claimed by the New York Times are indicated in Figure 18 as being within the yellow circles. It is worth reflecting on the claim made by the New York Times that this is a location where a 500 to 1000 pound bomb exploded creating a debris cloud that was observed at a range of roughly 2.5 miles! A very careful look into the before and after yellow circles overlaid onto the before and after images shows a small dark region in the “after” image on the roof of a building where the New York Times alleges that a 500 to 1000 pound general-purpose bomb exploded on April 4, 2017. Associating such a negligible level of possible damage with the identified delivery location of a 500 to 1000 pound bomb is ludicrous and completely at odds with essentially everything known about the effects of explosives and bombing. The above before and after photographs are supposed to show the bomb damage done in the area associated with debris-cloud 3 identified in the panoramic shown in Figure 16. The author has shown this New York Times photograph to perhaps a dozen nonspecialists before the yellow circles identifying the alleged bomb-hits were added to the photo and asked them to find the bomb- damage area. None of them succeeded. Figure 19 below shows the size of the area where severe bomb-damage from a 500 to 1000 pound general-purpose bomb are expected and predictable at location 3, as identified by the New York Times. The yellow circle filled with hatching shows the area where buildings would be demolished. The large red dot on the left shows the building that would have been demolished if the bomb had hit in the location where the New York Times analysts allege there was bomb damage. The large red dot to the right of that building shows a building across the street from the demolished building that would also have almost certainly been completely destroyed. In the case of that building (see Figure 20), the blast overpressure on its front wall facing the street would essentially cause the complete failure of the outer walls facing the blast point. This would result in the collapse of loadbearing structures and the floors in the front half of the building facing the alleged bomb impact point. The rear of the building might have survived collapse, but the effects of the blast wave funneling through the structure could well cause the collapse of the back half of the building as well. Hence, an informed guess about the level of damage on that building would be “probable partial or total collapse.” In any case, nobody who knew anything about the effects of explosives could have possibly misidentified a minuscule blemish on the roof of a large building as evidence of an attack with a 500 to 1000 pound bomb. The level of damage alleged by the New York Times at this location is simply ridiculous when compared with the evidence used to identify this location as the bomb detonation site seen from 2.5 miles in the panoramic view. The above before and after photographs show what levels of damage would have occurred if the debris cloud 3 had been properly associated with the location of the identified target area. The inner circle has a diameter of roughly 100 feet, within which 30 psi or more blast would have caused the complete demolition of the building. The outer circle of diameter roughly 150 feet, shows the area within which a 15 psi or more blast could knock down masonry walls and buildings that are not constructed of steel reinforced concrete. In essence, a knowledgeable analyst who believed this site had been hit by a bomb large enough to create the debris cloud seen in the panoramic would have known to expect very heavy damage and demolished buildings at this location. In summary, NOTHING associated with this alleged forensic evidence of bomb damage at location 3 shown in the New York Times video supports the Times’ narrative of this event in Khan Shekhoun on April 4, 2017. The bombed area associated with bomb-debris cloud 2 shows exactly the same astounding disparity between levels of predictable and expected damage from a 500 to 1000 pound bomb relative to what is identified as bomb damage by the New York Times and Bellingcat analysts. Figure 21 shows the location of bomb cloud 2 as seen in the panoramic view of Khan Sheikhoun from the North looking South. Bomb cloud 2 indicates the detonation of a 500 to 1000 pound general-purpose bomb. If the site located by the New York Times was correctly identified, the debris cloud in this image would be at a range of about 1.5 miles. At the time the image was taken the cloud-top was at an altitude of about 500 to 600 feet. Given the size of the explosion, the expected levels of damage from a bomb of this size would be extensive if it had landed in an area populated by buildings. Figure 22 shows a video frame from the New York Times video that is constructed from a composite of a section of the Bellingcat panoramic view, and an elaborate three-dimensional representation of Khan Sheikhoun looking from north to south. The locations of the three bomb-debris clouds and the archaeological mound are all identified with markings to make it easier for the reader to compare these features in both figures 21 and 22. The bottom half of the above composite image from the New York Times video published on April 26, 2017 shows the two debris clouds from explosions that allegedly occurred in an attack on Khan Sheikhoun on April 4, 2017. The composite image asserts that the two identified bombing sites were determined with line-of-sight analysis using the panoramic image from the video camera north of Kan Sheikhoun. The analysts claim to have used line-of-sight data in combination with digital satellite imagery to locate the areas where the bombs shown in the lower half of the composite fell. However, examination of the satellite images of the location 2 where the bomb allegedly exploded shows no evidence of bomb damage. The disparity between the expected and observed levels of bomb-damage at the identified location of site 2 where allegedly a 500 to 1000 pound bomb fell are just as dramatic as in the case of site 3. Figure 23 at the top of the next page again provides the reader an opportunity to see the uncluttered before and after satellite images of the bombed area. Even after knowing and studying the claims by the New York Times analysts about the damage at this site, it is still difficult even with foreknowledge to quickly find the area of claimed damaged. Individuals with no prior knowledge of the claims of damage in the before and after images shown in the New York Times video have an equally hard time finding the damage alleged by the New York Times in this case (site 2) as in the case of site 3. Figure 24 in the middle of the next page identifies the alleged bomb-damage location with yellow circles in the before and after images of the alleged hit-location. The after image shows a small slightly oblong dark area on the roof of a building. According to the New York Times analysts, this is the identified area of bomb-damage from a 500 to 1000 pound bomb. Figure 25 is an image from the New York Times video where it is alleged that photos of the bomb-damage have been taken on the ground at site 2. This particular photograph indicates an astonishing disparity between the bomb-damage that would occur if a 500 to 1000 pound bomb came through the roof at that location and the damage claimed by the New York Times analysts. As shown in Figure 26, on the following page, a 500 to 1000 pound bomb would have completely demolished the building it hit and would also have demolished the building across the street, which can be seen in the photograph in Figure 25, allegedly taken at damage location 2. The yellow hatched inner circle in Figure 26 shows the circular area of roughly 100 feet in diameter where the detonation of the bomb would produce a blast overpressure of 30 psi or more! Such a high level of blast overpressure would completely demolish structures beyond and within the inner circular area shown in the figure. The outer circle shows the area in which a 15 psi overpressure or more would occur. A 15 psi overpressure would be enough to severely damage or knock down most stone masonry walls of the type that appear to be ubiquitous in the construction used in Khan Sheikhoun. Thus, almost all of the buildings along the entire length of the block in figure 26 would have been demolished or rendered unusable. Yet the New York Times claims an ambiguous possible small hole in the roof that is seen on a low resolution satellite image is evidence for bomb damage that should have shown demolished buildings across the area at issue. Finally, it should be noted that the location of site 2 is NOT along the line-of-sight to debris-cloud 2 in the panoramic view. Thus, the New York Times claims damage from a large bomb in an area that is not along the observed line-of-sight in the panoramic view that shows no evidence of bomb damage associated with a bomb-debris cloud allegedly used to find the bombed location. This complete disconnect between the bomb-damage at both sites 2 and 3, and the serious line-of-sight discrepancies associated with the identified location of bomb-damage site 2, are serious internal inconsistencies with the narrative produced by the New York Times and its analysts. In the next section on bombing site 1, even more serious inconsistencies and discrepancies between claimed findings in the New York Times video and ground-truth will be identified and discussed. The before and after satellite images of site 2 where the New York Times analysts assert bomb damage from a 500 to 1000 pound general-purpose bomb is shown above. It is a useful exercise for the reader to try to find the differences that indicate bomb-damage in the image from February 21, 2017 and from April 6, 2017. The two yellow circles in the before and after images show the minuscule feature in the after image associated with the observed debris-cloud 2 that is claimed as evidence of damage from a 500 to 1000 pound bomb. The image on the left side of the above video frame from the New York Times video shows a photograph of the alleged bomb damage at the site where debris cloud 2 was generated in the attack on April 4, 2017. It is not possible to determine if this damage area is in any way associated with a satellite image. However, it is easy to determine that the damage in the photograph could not possibly have been so small if a 500 to 1000 pound general-purpose bomb had gone through the roof at this location. A photograph from the same spot would simply show nothing but rubble, including the rubble of the building wall across the street behind the parked vehicle. An actual photograph of this location after a hit with a 500 to 1000 pound bomb would show that the surrounding buildings had been completely demolished. The areas of expected bomb-damage at site 2 where a bomb-debris cloud was observed in the panoramic view, are shown in the markings projected over the after satellite image taken on April 6, 2017. The large red dot in the center of the hatched yellow circle shows the spot where New York Times analysts claim a 500 to 1000 pound bomb hit. The hatched yellow circle shows the outer limits of an area where the blast wave from the bomb would be roughly 30 psi or higher. This level of blast overpressure would demolish all the buildings within and beyond the inner circle. The outer yellow circle shows the area within which a 15 pounds per square inch or more would occur. This level of overpressure would be enough to cause the collapse of or extreme damage to stone masonry walls of the type that appear to be ubiquitous in building construction in Khan Sheikhoun. Thus, the level of damage associated with such a bomb-hit should essentially be the “flattening” of almost all the buildings along the full length of the block. It should be no surprise why this class of general-purpose bomb was called a “blockbuster” in World War II. Figure 27 is derived from the same New York Times video frame as in Figure 22. The important difference between these two figures is the overlay of markings that provide information to the reader. In particular, there are three ellipses shown in yellow that indicate roughly the size of areas of destruction expected from bombing attacks. The smallest and right-most ellipse shows the estimated size of the area of destruction at debris-cloud site 2, which has been discussed in detail in the prior section. The left-most ellipse shows an area that was completely demolished when it was bombed in March 2015. The New York Times video shows video that it alleges was taken of the March 2015 attack (see Figure 29). The video shows that three bombs were dropped on the target. The video also shows the initial development of the bomb-debris cloud from that attack (Figure 28) and aerial photographs of the damaged area (Figure 31), which extends over a roughly circular diameter of about 400 feet. The size of this area is consistent with the dropping of three 500 to 1000 pound bombs onto the target. As can be verified by examining the panoramic view of bomb-debris cloud 1, it is very clear that this cloud has a significantly larger base-diameter than debris-clouds 2 and 3. The base-diameter of the debris-cloud 1 is more than twice that of debris-clouds 2 and 3. The area covered by the base of this debris cloud is between four and six times larger than the area covered at the base of the other two debris-clouds. This is exactly the expected result from a bombing that uses three bombs rather than one. These observations strongly suggest that debris-cloud 1 is explained by a multiple bomb attack. Another possibility is that a single bomb was dropped on a large ammunition dump and secondary explosions led to the creation of a debris-cloud and area of ground-damage that had a very large base-diameter. In either case, the debris-cloud indicates a very much larger area of destruction than what should have been found at sites 2 and 3 – assuming that any bomb-damage was observed at these other two locations consistent with the debris-clouds seen in the panoramic. The markings on the above image identify important indicators that raise questions about the veracity of the New York Times analysis. The three yellow ellipses show the rough size areas that should have been subjected to high levels of damage in the form of demolished buildings. As has already been shown, no such damage is present in either the bombed sites associated with debris cloud 2 and debris cloud 3. The left-most ellipse shows the area damaged in March 2015. The New York Times video contains video of the bombing that it claims was taken in March 2015. The New York Times video also shows before and after satellite images of the area demolished in March 2015. Direct comparison of the size of the debris clouds from the March 2015 attack and bomb-debris cloud 1 that the Times alleges was the result of a bombing attack on April 4, 2017 indicate that the size of the severely damaged area associated with debris-cloud 1 should be about the same as that associated with the site that was bombed in March 2015. In spite of the fact that the New York Times analysts provided evidence of extreme large-scale damage associated with the March 2015 attack, they allege infinitesimal bomb damage at site 1. Thus, the analysts were informed of the large spatial scale of the demolished area from the attack of March 2015 but still claim infinitesimal damage at site 1 is convincing evidence of an attack involving multiple bombs or large secondary explosions. This is yet another inexplicable inconsistency in the analysis put forward in the New York Times video and by Bellingcat. The remaining images and their subtitles provide all of the information about the serious discrepancies between the bomb damage recognized by the New York Times analysts at the bombing site associated with the March 2015 attack and the minuscule bomb-damage asserted by the analysts to indicate a similar bombing at site 1 on April 4, 2017. The images and subtitles tell the story so there is no point in repeating it further in this main text. The above photograph shows the late debris cloud from a bombing in March 2015 in Khan Sheikhoun of a target area (referred to above as “silo”) discussed in the New York Times video published on April 27, 2017. The sequence of video frames from that video shown in Figure 29 below show that three bombs were dropped on the site. Note that the base of the debris cloud is very close to the same size as the base of the large debris cloud 1 in the panoramic image that is incorrectly identified as having been taken on April 4, 2017. Plates A through F show the sequence of events that indicate three bombs were dropped on a target that was alleged to be the site of a warehouse and silos in Khan Sheikhoun in March 2015. Plate A shows the target immediately before the impact of the bombs. Plate B shows the three distinct early debris clouds from the bombs that were dropped, and plates C and D show the evolution of the debris cloud from the three nearly simultaneous bomb explosions. As will be shown in the Figure 30, the base dimensions of this debris cloud is very close to that of the base dimensions of the debris cloud 1 in the panoramic view. The image of the late-debris cloud from the March 2015 (derived by scaling Figure 28 above) attack is inset on images of debris- clouds 1 and 2 allegedly from a bombing attack on April 4, 2017, according to the New York Times video. The inset images from Figure 28 were scaled so that the buildings in the foreground of each of the two original images would be roughly on the same spatial scale to facilitate a visual comparison of the two bomb-debris clouds. As can be seen, even accounting for uncertainties in the scaling, the very large base diameter of debris-cloud 1 indicates that multiple bombs were used in that attack. The images of the target hit in March 2015 are shown in both the satellite image on the left and the image on the right taken by a small drone carrying a television camera. As can be seen, the area severely damaged is about 400 feet across. the New York Times video, the question arises why did they associate minuscule to nonexistent damage at site 1 with a major bombing when they were fully aware of the large scale area of destruction associated with the bombing in March 2015. The satellite photograph used as the base-image in Figure 32 above is also well-suited to show the off-alignment of bombing site 2 relative to the line-of-sight determined by the panoramic view. This shows that an area of potentially several square blocks could have been totally demolished if the two bombing sites were actually along the line-of-sight established by the panoramic view. Since there is no significant damage exhibited in the satellite photographs of both alleged bombing sites, this underscores the absurdity of the claims made in the New York Times video when compared to the actual forensic evidence. This seemingly narrow technical discussion of the disparity between forensic evidence that allegedly indicates a nerve agent and bombing attack in Khan Sheikhoun on April 4, 2017 is of profound importance to US national security and to our democracy. The White House produced a false intelligence report on April 11, 2017 in order to justify an attack on the Syrian airbase at Sheyrat, Syria on April 7, 2017. That attack risked an unintended collision with Russia and a possible breakdown in cooperation between Russia and United States in the war to defeat the Islamic State. The collision also had some potential to escalate into a military conflict with Russia of greater extent and consequence. The New York Times and other mainstream media immediately and without proper review of the evidence adopted the false narrative produced by the White House even though that narrative was totally unjustified based on the forensic evidence. The New York Times used an organization, Bellingcat, for its source of analysis even though Bellingcat has a long history of making false claims based on distorted assertions about forensic evidence that either does not exist, or is absolutely without any evidence of valid sources. On September 17, 2013 the New York Times published on its front page a totally bogus false claim based on an alleged analysis produced by Bellingcat that concluded using untrue assumptions about the excessively long range of a sarin-carrying munition that the nerve agent attack on August 21, 2013 had originated from a site deep inside Syrian government controlled territory. My colleague, Richard Lloyd, and I produced analysis and reported to Times management that that the munition could travel could only travel two kilometers or less nearly, not the 10 km range that formed the foundation of the conclusions published by the Times. Yet in spite of the uncontested accuracy of this science-based fact, the New York Times stuck to its rhetoric and did not make any effort to re-examine the foundations of the narrative it knew had to be false in the face of these facts. This history of New York Times publishing of inaccurate information and then sticking by it when solid science-based forensic evidence disproves the original narrative cannot be explained in terms of simple error. 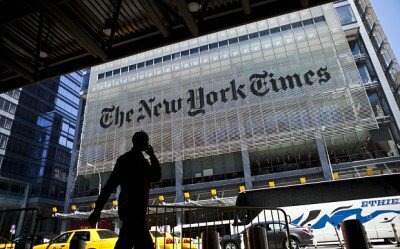 The facts overwhelmingly point to a New York Times management that is unconcerned about the accuracy of its reporting. The problems exposed in this particular review of a New York Times analysis of critically important events related to the US national security is not unique to this particular story. This author could easily point to other serious errors in New York Times reporting on important technical issues associated with our national security. In these cases, like in this case, the New York Times management has not only allowed the reporting of false information without reviewing the facts for accuracy, but it has repeatedly continued to report the same wrong information in follow-on articles. It may be inappropriate to call this “fake news,” but this loaded term comes perilously close to actually describing what is happening. If the wind was blowing in the opposite direction as shown in the panoramic view on April 4, the sarin from the alleged sarin-release site would have drifted into open fields and would not have reached any populated areas for more than half a kilometer. As such, there would be no casualties from a sarin release at this location as alleged by the New York Times, Human Rights Watch, and Bellingcat. Given the small size of the container (containing no more than 5 to 10 liters) that was alleged by Bellingcat as carrying sarin, and the large distance between the nearest populated area and the sarin- release site, even with near ideal weather conditions for a deadly sarin dispersal, there would have been essentially NO casualties from the sarin-release in any densely populated areas downwind. Damage site 1 identified by Bellingcat as being associated with a similar very large bomb-debris cloud created on April 4, 2017 shows only minuscule damage relative to the vast area that was demolished in March 2015. This evidence suggests that New York Times management did not check the accuracy of the facts supporting the narrative of events on April 4, 2017 that the Times has been publishing, and continues to.